Safaricom (www.safaricom.com), headquartered in Nairobi, Kenya, is the largest cell phone provider and the most profitable company in East Africa. As they have moved to extend their service range to the rural areas of Kenya they have encountered more and more sites for their base stations where no utility power is available. The normal practice at such sites is to use two diesel generators, one operating all the time and another serving as back-up. But, diesel power is far from ideal. Supplying fuel in areas where the roads are very poor and armed escorts are sometimes required is very expensive. Also, the diesel generators are under-loaded so they are not operating very efficiently and they require more frequent maintenance. 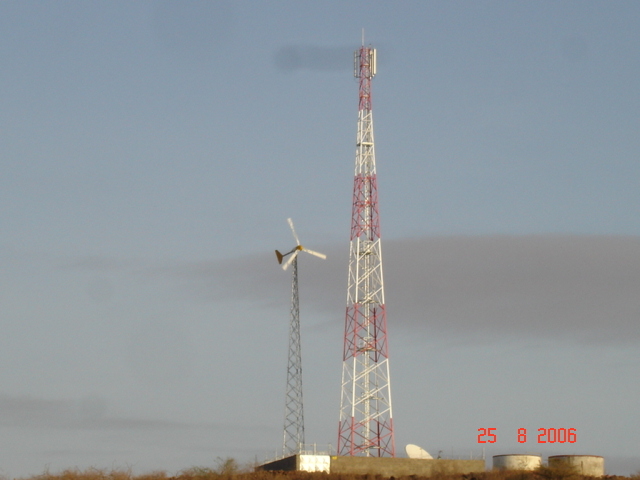 In 2005 Safaricom contracted with Winafrique Technologies in Nairobi to design and supply pilot wind/diesel hybrid systems at three very remote base stations. 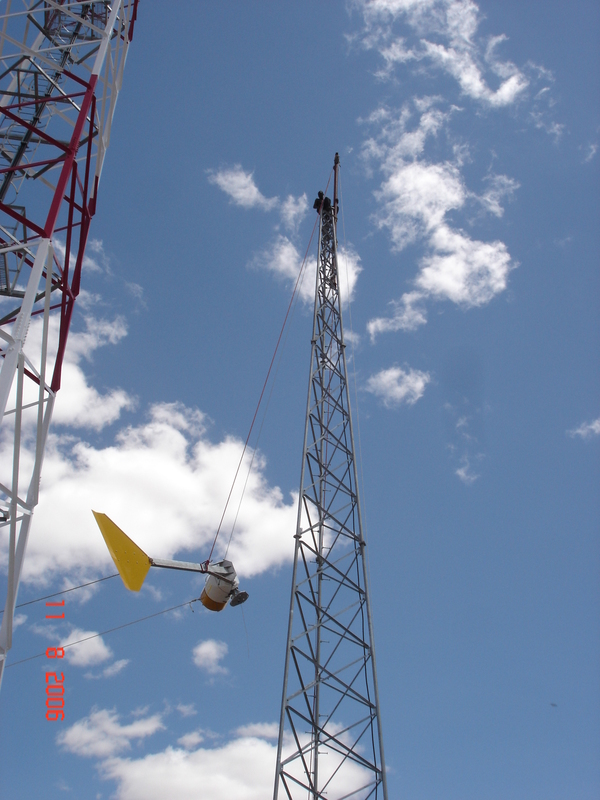 The systems consisted of a Bergey 7.5 kW turbine on a 24 m (80 ft) SSV tower, sealed batteries, and an inverter. These sites were installed and monitored for one year. The results showed excellent reliability and diesel fuel savings of 70-95%. Based on these positive results, Safaricom has contracted for six more sites, and has many other wind/diesel sites in the planning stage. 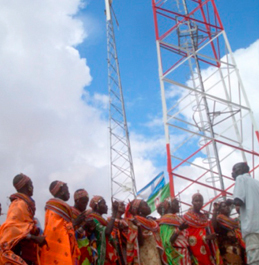 The picture above shows the October 26, 2006 dedication ceremony at Laisamis, one of the new Safaricom sites. 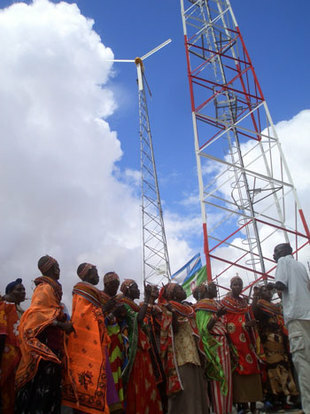 The dedication was attended by Michael Joseph, CEO of Safaricom, the local MP, numerous regional councilmen, Mike Bergey of Bergey Windpower, the staff of Winafrique Technologies, and several hundred local residents. Laisamis is a town of 1,000 people of the Soboto tribe (related to the Masai) located ~ 200 miles North of Nairobi. Getting to Laisamis from Nairobi is a 24+ hour drive on bandit filled roads. Laisamis has no electricity, no running water, no sewers, no radio, no TV - but it does have cell phone service. Even though Laisamis is very remote and the household income is very low, the new Safaricom base station is already handling thousands of calls a day. In fact, the lack of electricity to charge local cell phones has emerged as a barrier and Safaricom will soon add a battery charging station to their base station facility. That too will be powered by the wind. Cell phones allow children to talk to parents who have gone to work in the major cities, law enforcement to spread the word on cattle thefts, and clinicians to seek the advice of doctors. 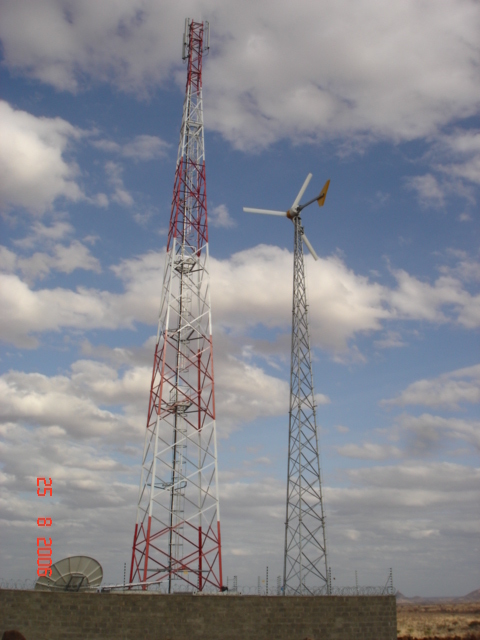 UPDATE: December 2008: Safaricom now has over 40 sites with Bergey 7.5 kW turbines installed and plans to add ~ 20 more in 2009.